This is a picture I didn't know I'd taken. Yesterday I heard the first cuckoo here. Late, very late, but welcome. 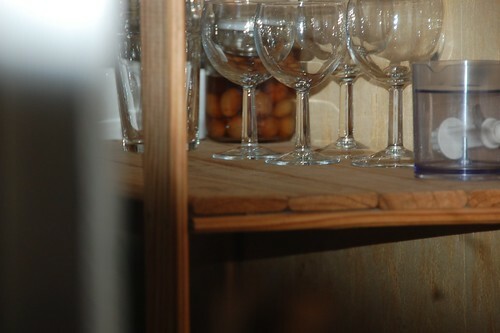 I thought that this year there might not be one at all, a little worrying and unnatural. Not that they're very nice birds I know, but the sound is so evocative of the season. The Striped Bunch beans are looking good, pictured here on their first exposure to the wicked world. I'll have to keep an eye on them today because last night the weather broke and there was lightning, thunder and precious rain. Today may bring more of the same and these tender babies wouldn't like that one bit, even if it does make me dance naked around the yard with joy. 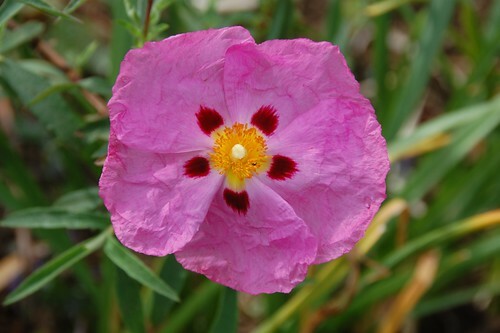 This pretty but rather ordinary cistus is a flower with history. I picked its first parent from a piece of civic planting in the Teville Gate arcade (is that even there any more?) 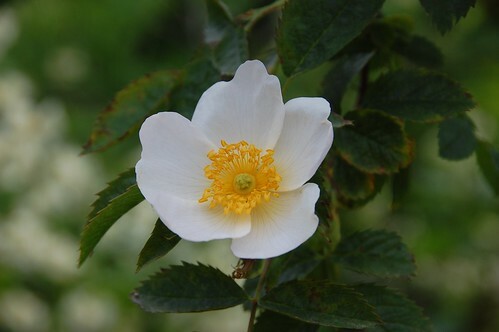 and rooted it for my garden in Worthing, cuttings from that followed me to my first French house and from there to here. If we ever move on I shall want to take it with me again, even though it would be easier just to buy a new one from a shop. This plant has shared things with me that another plant has not. 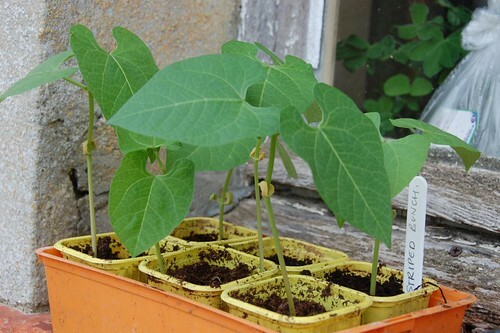 Planted two days ago, White Emergo runners beans straight into position, the new seed this time. The Salt Spring Sunrise tomatoes are planted out as well, looking rather starved and ill but some lovely thundery rain should help them perk up in no time. Yesterday, the Sweet Dumpling squash went into their bed on the compost heap in the back garden, I'm hoping they'll do much better than the Butternuts I usually grow in that position. Amaranth and cucumbers are germinated but it looks like the Quinoa seed is dud. Maybe I didn't want to grow quinoa this year anyway.